Rick's Firearm Academy of Detroit salutes Black History Month by honoring patriots who fought for freedom. Today's honoree is the Black Panther Tank Battalion. The 761st Tank Battalion was activated on April 1, 1942, at Camp Claiborne, Louisiana, and deployed to Europe, landing at Omaha Beach in France on October 10, 1944. 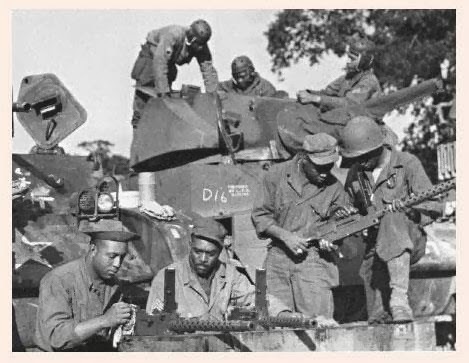 Later referred to as the Black Panther Tank Battalion, the 761st was attached to the XII Corps' 26th Infantry Division, assigned to Gen. George S. Patton Jr.'s Third Army, an army already racing eastward across France, and committed to combat on Nov. 7, 1944. They engaged the enemy for 183 straight days in six European nations. No other unit fought for so long and so hard without a break. As a result of their great fighting abilities they spearheaded a number of Patton's moves into enemy territory. They forced a hole in the Siegfried Line, allowing Patton's 4th Armored Division to pour through into Germany. They fought in France, Belgium, and Germany, and were among the first American forces to link up with the Soviet Army (Ukranians) at the River Steyr in Austria.